The Gist: A priest and the son of an empress try to protect a young woman from a vampire who needs her to create a new breed of vampire that can walk in daylight. Clarification: So this film is in Russian but does have English subtitles. It's an old school Dracula style film. Your run of the mill village in the shadow of a castle is scared of the vampire who lives in it story. 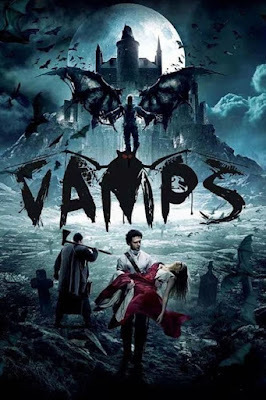 The story is very similar to the Van Helsing movie actually which also had a vampire trying to create an army of vampires while harassing a village story. The story revolved around a girl named Melina (Aglaya Shilovskaya). The vampire in this had his way with her mother so she is a spawn of a human and a vampire so her blood is the key to giving vampires the ability to walk in daylight (like the Van Helsing TV show) so keeping her away from them is the key to saving humanity. This is one of those does she or doesn't she films were you spend the whole thing wondering if the one girl everyone is losing their mind over gets turned. Well the answer is....Kind of. The main vampire does get her (see below) and does his blood mixing whatever to her. This results in her pretty much turning. But in a large amount of fairy tale deus ex machina the man who loves hers blood accidentally dripping into her mouth while he's trying to force himself to destroy her cures her almost immediately after. Biggest Complaint: The vampires in this movie are pretty much just a hoard of zombies. They don't have fangs and attack in large groups like any other zombie movie. Outside of Melina's turn you get one group of female vampire extra's that get screen time for 2 or 3 seconds at a time during the attacks. I give the film a Vampire Beauty Rating of 2 out of 5. It's a good movie but nothing that hasn't been done before and no eye candy to set it apart.